In spring of 2018, the sale of The Collection of Peggy and David Rockefeller will take place at Christie’s Rockefeller Center Galleries in New York. In keeping with David Rockefeller’s pledge to direct the majority of his wealth to philanthropy and provide for the cultural, educational, medical, and environmental causes long supported by him and his wife, all of the Estate’s proceeds from the sales across a wide variety of categories will be donated to the Rockefeller family’s charities of choice. As such, it will be the most important philanthropic auction ever held. A Picasso Rose Period masterpiece, executed in 1905, Fillette à la corbeille fleurie is a highlight of the collection (estimate in the region of $70 million). Rich in pathos in its depiction of bohemian life at the turn of the 20th century, this rare work is a technical tour de force of draftsmanship and atmosphere. The painting maintains a storied provenance; it was acquired in 1905 by brother and sister, Leo and Gertrude Stein, and passed to Alice B. Toklas upon Gertrude’s death in 1946, where it remained throughout Alice’s lifetime for another 21 years. In 1968, David Rockefeller formed a group of important art collectors to acquire the renowned collection of Gertrude Stein. Drawing slips of numbered paper from a felt hat, David Rockefeller drew the first pick in the syndicate, and he and Peggy were able to acquire their first choice of the Young Girl with a Flower Basket, and placed it in the library of their 65th Street New York townhouse. The most important work by Henri Matisse to be offered on the market in a generation is Odalisque couchée aux magnolias, painted in Nice in 1923 (estimate in the region of $50 million). The subject of the odalisque, the reclining female figure, held special significance for Matisse as it presented the opportunity to measure his art against past masters. 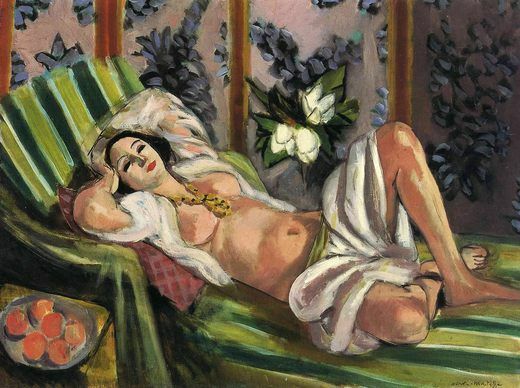 Odalisque couchée aux magnolias, with its symphonic synthesis of pattern and form, has long been counted among the greatest of Matisse’s paintings in private hands. This sumptuous painting resided in the living room of Peggy and David’s Hudson Pines home. Odalisque couchée aux magnolias is also the highest estimated work by Matisse to ever be offered at auction. Monet’s beloved garden of Giverny was a source of unending inspiration. Nymphéas en fleur is among the largest scale, most brilliantly colored, and vigorously worked canvases that the artist executed – a glorious tribute to the natural world (estimate in the region of $35 million). This work belongs to a group of paintings Monet painted in a burst of untrammeled creativity between 1914 and 1917, as Europe plunged into the chaos of war. Upon the recommendation of Alfred Barr, the first director of the Museum of Modern Art, Peggy and David Rockefeller visited the Parisian dealer Katia Granoff and purchased the present painting in 1956. “One, which was almost certainly painted in the late afternoon and in which the water is a dark purple and the lilies stand out a glowing white, we bought immediately,” David Rockefeller recalled in Memoirs. Also on offer: significant works by ,Georges Seurat, Juan Gris, Paul Signac, Edouard Manet, Paul Gauguin, Jean Baptiste and Camille Corot, among others. Gilbert Stuart (1755-1828), George Washington (Vaughan type), 1795. Oil on canvas. 29 x 24 in (74 x 61.3 cm). Estimate: $800,000-1,200,000. Charles Sheeler (1883-1965), White Sentinels, 1942. Tempera on board. 15 x 22 in (38.1 x 55.9 cm). Estimate: $1,000,000-1,500,000. Fairfield Porter (1907-1975), The Schooner I, 1965. Oil on canvas. 37 x 54 in (94.2 x 137.5 cm). Estimate: $1,000,000-1,500,000.